Leadership is the holy grail of project management. According to CEB Global, project managers that possess entrepreneurial (leadership) skills are 40% more likely to deliver project outcomes, but only 30% of project managers have these skills. A recent article in the Project Management Journal, “What Are The Characteristics That Software Project Team Members Associate with a Good Project Manager,” identified seven attributes of a good project manager all of which are leadership skills. Industry-based, quantifiable metrics would help guide the change and measure our progress. The process would be ongoing and sustainable. The first step was finding a framework that resonated with our organization and described measureable behaviors. Inspiration came from Andy Crowe’s book, “The Alpha Project Manager.” In his quest to identify the traits of the best project managers, Crowe surveyed 860 project managers and their stakeholders. His research found that only 2% of the project managers met his alpha criteria. He also revealed that most project managers perceived their performance to be significantly higher than their stakeholders’ assessment. We employed a 360-evaluation method. Each project manager selected 3-5 project stakeholders to evaluate him or her. The project manager completed a self-assessment and their manager also rated their capabilities. Each question was scored on a scale of 1 to 100. A score of 50 was considered “satisfactory” performance. Scoring was on an absolute scale, so senior resources were expected (and tended) to have higher scores. We chose a 100 scale to provide room for space differentiation. We conducted the survey twice a year. Surveying more often might lead to fatigue, and less frequently would not provide enough feedback. The survey was not linked to our formal performance management process. 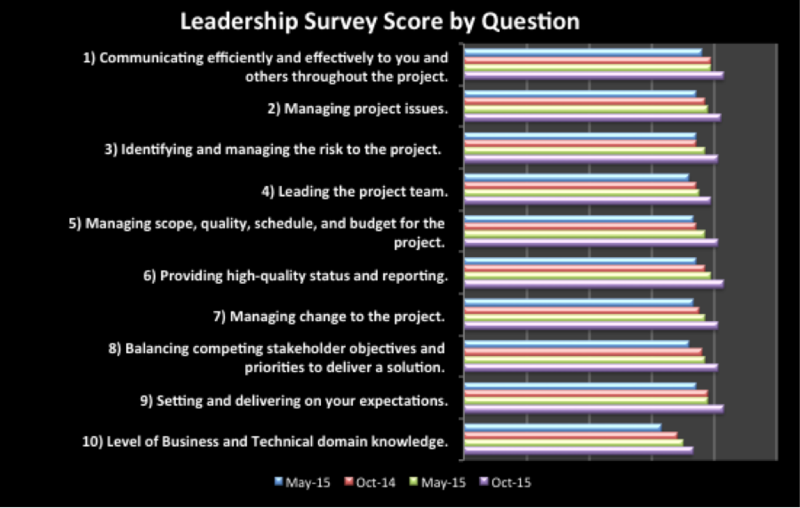 We wanted the project managers to embrace the survey as a safe, self-assessment tool. I shared the organizational-level metrics with the team, our clients, and our leadership. In these presentations, we shared general trends, areas of strength and opportunity, and the relative performance of sub-groups; for example: employees vs. service providers, senior vs. junior PMs, and performance by portfolio. Managers also shared personalized results with each project manager. Individual respondents remained anonymous, but we shared the aggregated results. The intent was to provide each project manager with insights to help guide their personal growth and development. Since the project managers and their managers assessed their performance, the process allowed us to calibrate perceptions and expectations. In our initial survey, the average perception gap (PM vs. client score) was 11 points; in subsequent rounds that gap fell to near zero. Interest in the survey persists. We continue to have survey response rates close to 70%. Average scores have improved from 73 to 81 points—representing a 30% improvement. Generally, senior resources outperform more junior ones. There is also a 3-6 month learning curve for new project managers to acclimate to our environment. Generally, employees have higher scores than our managed service partners. 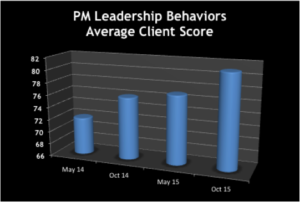 Our performance against most of the leadership behaviors are close to the same level. Domain knowledge lags behind the other metrics and is related to experience in tenure with specific functional areas and applications. Suggested external reading and self-directed learning opportunities. After two years, I am proud of our accomplishments. We have created clear measures of performance. We have changed how the project managers are perceived and how they perceive themselves. The journey is on going. Leadership continues to be an important organizational goal. “Building Entrepreneurial Project Managers.” Entrepreneurial Project Managers. CEB Global. Web. 1 Dec. 2015. https://www.cebglobal.com/exbd/information-technology/pmo/project-manager-effectiveness/entrepreneurial-project-managers/index.page? Crowe, Andy. Alpha Project Managers What the Top 2% Know That Everyone Else Does Not. Kennesaw, Georgia: Velociteach, 2006. Print.